The Capital City Auto Parts motto of “why buy new when used will do” still applies today but it doesn’t capture the full scope of our operation. Our family business isn’t limited to used parts as we also sell remanufactured, aftermarket and new parts in order to meet your exact needs. We offer fast shipping anywhere in Canada. When you visit Capital City Auto Parts, the largest auto recycling facility in Fredericton, you benefit from a staff that is experienced and knowledgeable. We utilize a computerized inventory, parts locating system, parts interchange guidelines and aftermarket suppliers to find what you need fast and at the lowest prices possible. We back all our parts with an unbeatable warranty and guarantee to meet or beat any written competitor offers. 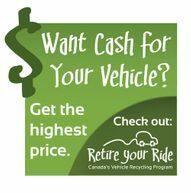 As your trusted and certified Fredericton auto recycler, we pay cash for your used and end-of-life vehicles. You can rest assured that we follow all environmental and safety regulations when dismantling and processing your car or truck. Bring us your old vehicle or have it towed in. Either way, we’ll give you a fair price and peace of mind. Read more about our environmental regulations at carec.ca.